Cool Stars 14 (CS14) was held in Pasadena, 5-10 November 2006, and was jointly hosted by the Spitzer Science Center and the Michelson Science Center. CS14 also doubled as the 2006 Spitzer Science Center November Workshop. 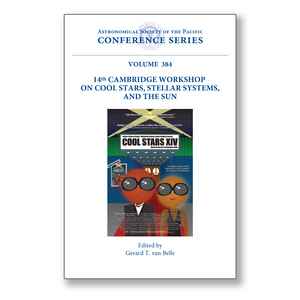 Topics that were central to the previous Cool Stars Meetings -- stellar activity indicators, the solar-stellar connection, PMS stars and stellar evolution, brown dwarfs, and helio-and asteroseismology -- continued to be high on the agenda for CS14. Enhanced emphasis was also placed on topics such as mid-IR observations (debris disk evolution; protostar formation) and high-angular resolution observations (PMS disk imaging, PMS binary orbits, future space astrometry missions). Main plenary session topics included Helioseismology and Abundances, Star Formation (Cores to Disks), Brown Dwarfs, Solar/Stellar Magnetic Fields, Testing Stellar Evolutionary Models, Extrasolar Planets, and Stellar Winds an Spins: From Birth Through the Main Sequence. Additionally, nine splinter sessions examined the following topics in detail: Spectral Diagnostics of Hot Plasma from Cool Stars, The Formation of Low-Mass Protostars and Proto-BDs, Mining the Next Generation of Surveys for Cool Star Science, Stellar Ages, Disks around Cool Stars and Bds, Cool Stars in Hot Places, Habitability and Life on Planets around Cool Stars, Sub-Stellar Twins: Binarity in Bds, and Coronal Structure of PMS Stars. The presentations of the seven main sessions are detailed with reviews in this volume, in addition to summaries of the nine splinter sessions. The book is suitable for researchers and graduate students interested in the astrophysics of cool stars and the sun, including abundances, magnetohydrodynamics, circumstellar disks, stellar rotation, pulsation and mass loss.